AUSTRALIE – Brisbane - Missing fragments from the ancient Egyptian Book of the Dead have been uncovered deep in the stores of the Queensland Museum. The manuscript belonged to a high-ranking Egyptian official who lived in 1420 BC. It was believed to contain magical spells to guide the dead to the afterlife. Parts of the manuscript were discovered in the late 19th Century, but archaeologists have never found it all. Queensland Museum chief executive Ian Galloway says the manuscript fragments were donated to the museum by a woman 100 years ago. The museum has a name but does not know how the fragments came to be in her possession. ROYAUME UNI – Caerau - Archaeologists from Channel 4 show Time Team have discovered 3,000-year-old homes and artefacts on the site of an Iron Age hillfort in Cardiff. Investigators had found a 3,000-year-old saddlequern tool and pieces of an Iron Age pot which they were able to put back together and almost reconstitute. A geophysical survey using a magnetometer to monitor the magnetic quality of soil at the site had detailed “to a remarkable level” what was under the ground and would have found at least half of what was there, including roundhouses and ditches. Mr Pryor said people would have first lived at the site around 3,000 years ago. “What’s been revealed is that there was occupation from around 1000 BC and it gets increasingly intensive through time. “At around about between say 300 and 200 BC there may have been as many as 100 people living up here, maybe more, in roundhouses, some of which were actually arranged in rows like miniature streets. “One of the things you so often find on hill forts is that they can have very light occupation on the interior, but this doesn’t. “There was terrifically heavy occupation – this was quite an important community. “The other thing the archaeology is telling us is that people were living here quite a long time. “There must have been generation after generation after generation of families who grew up here and lived up here. “The other thing that’s important about the site is that there are about eight springs at the top so they wouldn’t have been short of water.” Pottery artefacts such as corn grinding stones could date back to as far as 700 BC, said Mr Pryor. ROYAUME UNI – Forres - Works to construct the River Findhorn and Pilmuir Flood Alleviation Scheme due to start in September, are unlikely to be held up by excavation works currently being carried out on a site adjacent to the A96, to chart evidence of a historical settlement. Marks in the fields, which are believed to be an early settlement, probably Iron age, were photographed in the 1980s and must be recorded, before they are lost for ever, under the flood works. However, if the archaeolgists find anything of any historical significance at the site, then Mr Mann said that steps might have to be taken to postpone the works, and preserve the site which could also mean building the road around it. IRAN – Teheran - A number of shards were accidentally discovered on Thursday by a student of archaeology in the holes dug by the Tehran Province Water and Wastewater Company (TPWWC) in District 5, northwest of Tehran. “I saw the shards by chance in the historical strata of three holes dug in the area,” Mahsa Vahabi told the Persian service of the Iranian Students News Agency on Thursday. She said that she left the place after she could not find any relevant people to ask about the holes. But, she saw the shards smashed after she returned a few hours later. “I gathered the shards to be sure about their antiquity,” Vahabi said. Some professors at Vahabi’s university surmised that the shards date back to the Buyid dynasty (945–1055) after they saw photos of the shards. However, pieces of the shards were estimated to date back to the Iron Age. Some of the shards have mono-color glaze and floral engravings. USA – Micanopy - In 1835, rising tensions between settlers and the Seminole tribe led the military to build Fort Defiance in the area. Evacuated and burned about a year later because of illness and the inability of those stationed there to defend it, it was re-established in 1837 as Fort Micanopy. That fort's exact location has never been determined, but historical information indicates it was within what is now Micanopy's town limits. After working last year in Micanopy and with the help of residents and others who have found artifacts in and around the town, Ellis has submitted information to the National Park Service about his findings. He plans to “reveal” his conclusions about the fort's location to Micanopy's residents in June. The area in and around Micanopy, the oldest inland town in Florida, has been inhabited by people for more than 1,000 years, according to research and historical records. The Spanish explorer Hernando de Soto found a Timucua Indian village near the town in 1539. An Indian burial site, believed to date from around 800 A.D., is located in the Micanopy Native American Heritage Park. Some artifacts such as pottery found on property in Micanopy indicate the area was first occupied around 1500 B.C. EGYPTE – Karnak - A big archaeological slab dating back to the era of Ramesses III, the most famous king of the Dynasty 20 (The Modern State era) was found. 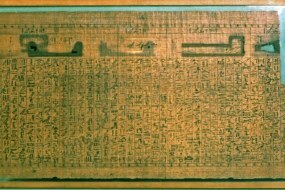 The slab shows Ramesses III while providing sacrifices and offerings to the god Amon Ra, the god of the country and the Egyptian empire at the time. Behind him as shown in the slab, stands his famous wife goddess Amont while wearing her famous crown. The Temple of Karnak is the largest Temple in the World! The complex contains a group of Temples such as the Great Temple of Amon Ra, The Temple of Khonso, The Ipt Temple, The Temple of Ptah, the Temple of Montho and the Temple of the God Osiris.